Note: If you are following along with the weekly menu plan, surprise! Pork chops will be on Thursday night, while chili was served on Wednesday. See how I did that? Shook it up a bit. I love a recipe that includes wholes of everything. One whole onion. One whole bell pepper. One whole can of tomato paste. No waste. Fantastic. The other thing about this recipe that is great is that Sheri suggests steps that simplify your cooking at night (and check out this post of Sheri's on portions). Cutting your veggies the night before or morning of is a great idea. And using your food processor would shorten the prep time up even more. 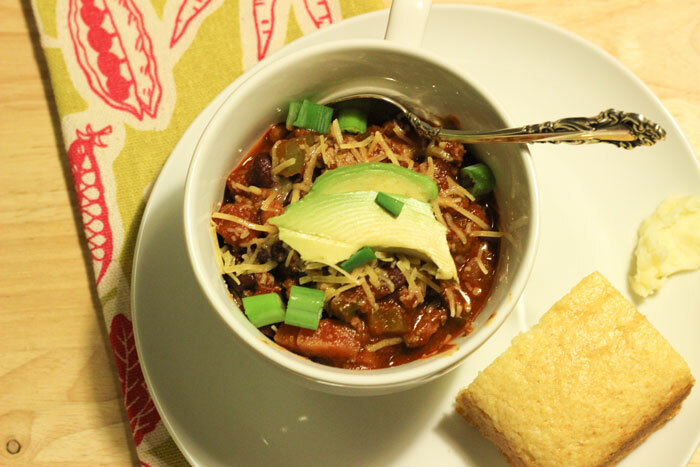 This chili recipe is quite basic – you’ve got your ground meat, your beans, your veggies. I did make a few modifications. First, I didn’t sauté the meat and vegetables together. Don’t ask. I don’t have a logical explanation. Second, I have a thing about cans. I just don’t like the smell of things that come out of them. I know, weird. I blame it on having to feed the cat when I was a kid. Anyway, this recipe calls for the liquid from two cans of beans (kidney – but I used one can of kidney and one can of pinto) to be used in cooking the chili. Instead of using the bean juice, I measured it out (1 cup) and substituted beer. Any old beer will do. I actually threw in the whole bottle of beer (11.2 ounces) because another little substitute that I made was using boxed Pomi tomatoes instead of a can of tomatoes, which resulted in about 2 ounces less liquid. Are you still with me? Sleeping now? Oh. And I didn’t use all of the chili powder because I ran out. It was close to 1/3 cup, but not quite. Must check spices when looking at ingredient lists for the grocery. Overall, this was good weeknight chili. My husband loved it. Gus ate his entire bowl. Impressive for a four year old. His previous encounters with chili have been of the “Ewww! Do I have to eat this?” variety. We served it with cornbread (boxed – sorry, I didn’t have it in me to make cornbread from scratch this afternoon), avocado, green onions, and chili. Cilantro would have been a great addition too. And corn chips. Yep. Definitely add some corn chips for the salt and a little crunch. Veggies you ask? Call Child Protective Services. I didn’t serve any tonight. We will more than make up for it tomorrow. This recipe made enough to feed everyone VERY well and freeze an enire container. Perfect for lunches when the older kids are home. I also froze my leftover cornbread. We'll see how that works out. And if you are wondering what the little people did while I was cooking? Legos. T built an entire palace bathroom for her princes and princesses, complete with toilet backs. "They are all on the potty, Mom!" I mean, seriously. Wouldn't you want a bathroom with a slide exit?